What a beautiful knife. Thanks hobbs for the info. This was the last one they had. I'm thinking about getting with Ryan to make a sheath for carry. Awesome !!! That wood has more character than the olive wood I have by the way. Really lightweight for the size but a sturdy knife and mine came pretty darn sharp out of the box. Good find !!! They aren't easy to come by. EDIT: I used a little boiled linseed oil as a preservative on mine. May not be the best choice for Olive wood but it's what I had on hand. Gave the wood a somewhat "golden" patina. Best choice may be mineral oil? ... maybe just hand oil from use. The wood pattern on mine is different mark side / file (back) side but not a deal breaker and certainly doesn't affect performance whatsoever. Mine has no blade play, vertical or horizontal, open or closed. 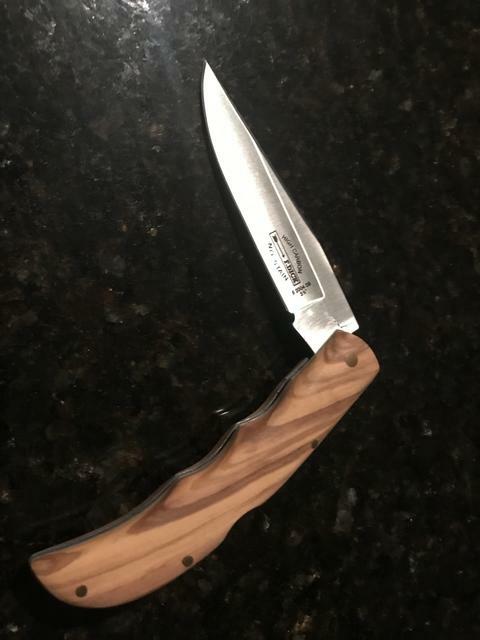 I think it's a very well put together utility knife with high quality components for the price point and unique in the chef cutlery world. Very slick/sleek elegant design with no nail nick nor need for one. I pocket carry mine. Rides well in jeans, but might also like a leather belt carry option. Ideally for me, would be open top friction fit sheath ... i think.